Pierre Quézel, Frédéric Médail, Roger Loisel and Marcel Barbero are with the Mediterranean Institute of Ecology and Palaeoecology in Marseilles, France. An evaluation of the biological diversity of Mediterranean forests and the challenges to be faced in ensuring their conservation. The plant diversity of Mediterranean forests is much greater than that of European forests. This rich diversity is a result of palaeogeographical (Verlaque et al., 1997) and historical factors as well as ecological conditions (Quézel, 1985). The Mediterranean region also shows closer interrelations than any other region in the world between its flora and major landscapes and the human activities that have been moulding them for nearly 10 000 years (Thirgood, 1981; Pons and Quézel, 1985). Indeed, Mediterranean plant biodiversity is to a large extent the result of a traditional and harmonious use of the environment. However, since the end of the nineteenth century, this balance has been upset in most places by over exploitation of natural resources or a general shift away from the land - two processes that have had different but equally harmful consequences for the conservation of species and habitats. Focusing on major or associated forest species, the following points will be examined: i) the wealth of woody species in the two Northern Hemisphere Mediterranean zones (California and the Mediterranean basin); ii) the bio-geographical origin of the endemic species; and iii) the heritage value of and threats to species and forests of the Mediterranean region. The wealth of species (both trees and smaller woody vegetation) found in Mediterranean forests has been recognized as one of the main features that distinguishes them from those in Europe (Quézel, 1976). A full- scale evaluation of these species has yet to be carried out: the difficulty of such a task would be compounded by the undetermined value of various nano-phanerophytes (2 m high land plants whose buds and shoots project on above-ground stems that persist from year to year), particularly for various large members of the Genista family (for example, Cytisus spp. ), certain representatives of the Tamarix or Salix genera, and even of the Cotoneaster, Rhus and Withania genera. The present survey covers only tree-like woody species that are capable of reaching at least 2 (%). Another difficulty is the classification of certain species as being preferential to either Mediterranean- or European-type forests, inasmuch as a fairly large number are found in both types. Deciding which region these species (for example, Quercus pubescens, Q. pyrenaica and Q. cerris) should be assigned to is not easy either. Based primarily on Flora Europaea (Tutin et al., 1968-1993) and the Med-Checklist (Greuter, Burdet and Long, 1984-1989), certain ambiguous taxa were excluded, as were those of disputed value (especially some belonging to the Quercus, Tamarix and Salix genera). Mediterranean forests have nearly twice as many woody species as European forests (247 as opposed to 135), with 158 exclusive or largely preferential species and subspecies, compared with 46 in European forests and 89 in both. There is a similar difference in terms of genera, with 34 exclusive to Mediterranean forests and seven to European forests; only among the Rosaceae family do European forests have more species (with Pyrus, Malus, Sorbus, Mespilus, Crataegus and Prunus). The situation is also the same for phanerophytes (flowering plants) associated with riparian forests (those near wetlands), with 22 woody species for the Mediterranean region (including 15 Tamarix), seven for the European region and seven common to both. The list of woody species in California (Raven and Axelrod, 1 978) was drawn up on the basis of Hickman (1993), despite some problems with the distinction between trees and bushes, especially within the Arctostaphyllos genus. Of the woody species in the Californian Mediterranean region, 76 out of 170 are endemic. A comparison with the Mediterranean region reveals major ecological, biogenetic and historical similarities in woody species (Mooney and Dunn, 1970; Quézel and Taylor, 1984) as well as a similarity in major floristic resources, with 34 of the 58 genera found in California also present in the Mediterranean. Moreover, until quaternary climatic disturbances led to their disappearance, the Mediterranean once featured a number of species still found in California - Sequoia, Sequoiadendron, Umbellularia, Tsuga, etc. (Roiron, 1992). Apart from the difference in area between the Mediterranean zones in Europe (2 300 000 km2) and California (324 000 km2), there is also a vast difference in the number of plant species (25 000 compared with 4 400, according to Quézel, 1985), although the numbers are very similar if areas of comparable size are examined (Médail and Quézel, 1997): for example, Mediterranean Morocco (300 000 km2 and 4 200 species) and Mediterranean California (324 000 km2 and 4 400 species). 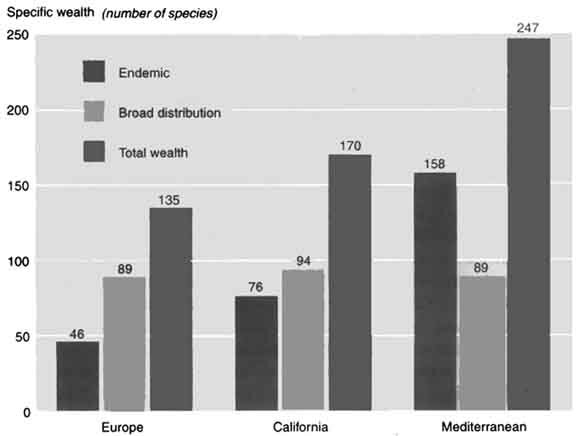 However, the region around the Mediterranean does have a much greater wealth of trees, including endemic species, than the rest of Europe or California (see Figure). Only four genera are endemic to California (Dendromecon, Sequoia, Sequoiaden-dron and Umbellularia), compared with 14 genera endemic or subendemic to the Mediterranean basin: Argania, Argyro-cytisus, Cedrus, Ceratonia, Chamae-rops, Fontanesia, Gonocytisus, Hesperolaburnum, Petteria, Podocytisus, Punica, Securinega, Tetraclinis and Warionia. The existence of a variety of major bio-genetic and biogeographical groupings (Quézel, 1985; 1995) is an essential element in explaining the wealth of forest species in the Mediterranean region. In the light of a recent study devoted to this issue (Barbero et al., 1999), only a general presentation of the biogeographical origin of the main widespread forest species is presented here (see Table, p. 25), whereas endemic species are analysed in greater detail because of their high biogeographical value and the fact that a number of them are seriously threatened. Species of northern stock have given rise to some endemic species with a low taxonomic value, particularly Alnus viridis subsp. suaveolens in Corsica (Gamisans, 1991); the neo-endemic Betula aetnensis described in Sicily on the basis of B. pendula; B. celtiberica described in central-western Spain on the basis of B. pubescens; and B. fontqueri described in Andalusia and on the Rif on the basis of B. pendula. Quercus petraea subsp. huguetiana is localized in northern Spain, while various other deciduous oaks, often with an uncertain taxonomic status, are found in Sicily, southern Italy, the Aegean region or the Near East. A considerable number of associated woody species are found throughout the Mediterranean basin, particularly within the Acer, Cotoneaster, Prunus, Pyrus, Salix and Sorbus genera. Endemic species of Mediterranean or meso-Aegean stock with a restricted range are fairly numerous and rich in biogeographical significance (Barbero, Loisel and Quézel, 1995). The most striking case is that of firs (Quézel, 1998), with a variety of related species found from the Straits of Gibraltar to Lebanon (Abies pinsapo, A. marocana incl. A. tazaotana, A. numidica, A. cephalonica incl. A. borisii-regis, A. cilicica), and in the case of Pontic firs, also in northern Anatolia. Other notable conifers include Cupressus atlantica, which is residual on the western High Atlas, and Pinus nigra subsp. dalamatica. Notable deciduous species include Quercus afares in the northeastern Maghreb, Q. euboica in Euboea (Greece), Q. vulcanica in central Anatolia (Turkey) and Arbutus pavarii in Cyrenaica (Libyan Arab Jamahiriya). 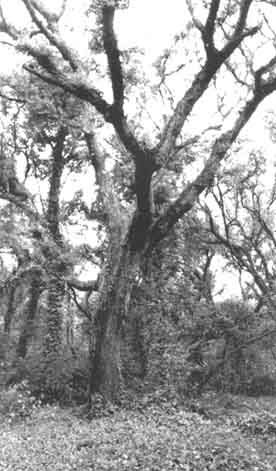 Liquidambar orientalis, a remarkable preglacial relic, is confined to southwestern Turkey (Adman et al., 1993) and the Dodecanese Islands, as is Quercus aucheri, a variant of holm oak. Some endemic forest elements of African stock play a marginal role in the region (Quézel, 1995), except in southwestern Morocco, where Argania spinosa and Acacia gummifera occupy an appreciable position, locally associated with Olea marocana and Dracaena draco subsp. 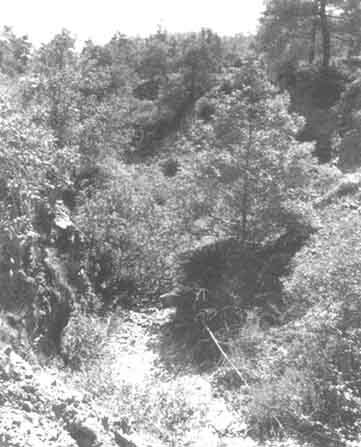 ajgal in the western Anti-Atlas Mountains (Benabid and Cuzin, 1997). There are few other endemic species of southern stock: Phoenix theophrastii, a neighbour of Phoenix dactylifera, is present in Crete and southwestern Anatolia (Yaltirik and Boydak, 1991); Securinega tinctoria is found in the southwest of the Iberian peninsula; while Argyrocytisus, Hesperolaburnum and Warionia are confined to Morocco. Finally, the Tamarix genus individualizes many species of restricted range in conditions propitious to their halohygrophilic (salt-tolerant) nature. Islands hold a good number of endemic woody species, and this is especially true of Sicily: Abies nebrodensis (Morandini, Ducci and Menguzzato, 1994) and Rhamnus lojaconoi, localized on the Madonie Mountains; Celtis aetnensis, very close to Celtis tournefortii, on Etna; and Zelkova sicula, a relict endemic species on Monte Lauro (Di Pascale, Garfi and Quézel, 1992). In Crete, Zelkova abelicea is still found in very small populations in the three main mountain areas. On the green rocks of Cyprus, Cedrus brevifolia lives at the meso-Mediterranean level (between 900 and 1 200 m) and Quercus alnifolia is found in stands between 1200 and 1900 m.
Many Mediterranean forest species show a genetic instability, which usually creates taxonomic uncertainties that are difficult to clarify. For example, among sclerophyllous oaks (species with small leathery leaves) the precise status of Quercus ilex (including Q. rotundifolia) or Q. coccifera (including Q. calliprinos) complexes has not been properly defined, despite many biochemical or genetic studies (Michaud, Lumaret and Romane, 1992). The same applies within the Juniperus, Pinus (Barbero et al., 1998) and Abies (Bergmann and Gregorius, 1992) genera, to mention only the gymnosperms where this approach is more advanced. This instability is also responsible for the very great facility for hybridization or introgression, often found among many Mediterranean forest species, particularly within the Quercus, Pinus and Abies genera. For example, there are innumerable natural hybrids of Quercus, such as Q. streimii (Q. pubescens X Q. sessiliflora) on the edges of the French Mediterranean region. Hybridization between Pinus brutia and P. halepensis has similarly been noted, as well as between P. sylvestris and P. uncinata (Barbero et al., 1998). The problem is more acute in the case of species or genera whose ranges do not touch: reforestation with Mediterranean firs is leading to massive genetic pollution with indigenous types (Quézel, 1998). Similar phenomena occur among many other genera (Acer, Fagus, Prunus, Sorbus, etc.) and should be considered when non-indigenous, taxonomically close species are introduced, in order to avoid drastic losses in biological capital - such as the deep hybridization of the most recent populations of Cévennes black pine (Pinus nigra subsp. salzmanii) following the massive introduction of other types of black pine. The most significant results of a study (Barbero et al., 1999) - using a global approach to the biodiversity and heritage value of Mediterranean forest communities - are summarized below. Mediterranean forests, especially the supra-Mediterranean deciduous forests of northern Africa (Numidia), Corsica and Greece, have great overall floristic wealth. Many montane-Mediterranean conifer forests, especially those of Cedrus spp. and Pinus nigra, hold over 100 species. The only meso-Mediterranean sclerophyllous forests that reach such levels are the Quercus calliprinos forests of the Near East. On the other hand, the lowest levels are found particularly in forests on the major Mediterranean islands - Acer sempervirens and Cupressus sempervirens forests in Crete (25 taxa) and Quercus infectoria subsp. 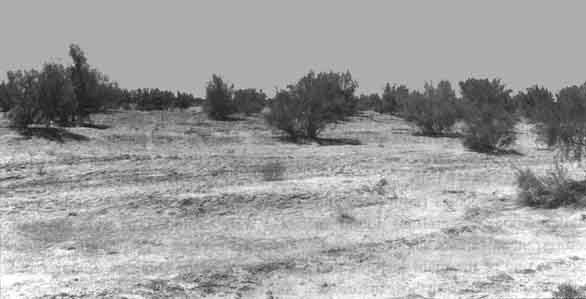 veneris forests in Cyprus (27 taxa) - and in arid bio-climates, such as Acacia gummifera forests in southwestern Morocco (25 taxa). There may also be a considerable wealth of phanerophytes, especially in certain deciduous forests: Corsican chestnut forests (29 taxa), Ligurian deciduous oak forests of Fraxinus ornus (29 taxa) and Greek Quercus frainetto forests (26 taxa), but also cedar and fir forests in the Near East (24 to 25 taxa). Mediterranean forests in general tend to be poor in endemic species, which represent only 5 to 10 percent of the total number of species. However, some regions have as many as 20 endemic forest species, and in the highest Juniperus foetidissima stands on the green rocks of the Troödos in Cyprus, 20 of the 31 species observed are endemic. In countries on the northern Mediterranean basin, the collapse of the age-old agrosilvipastoral system is leading to deep changes in the structure and architecture of forest and pre-forest communities of plants and animals and, in general terms, to an aging of forest populations (Barbero et al., 1990). In northern Africa, the ecological upheavals caused by deforestation and overgrazing give rise to a serious dysfunction, which affects high-altitude forests in particular. Although the ecological and socio-economic processes vary from region to region, the resulting ecological consequences are very similar: i) disruptions in the natural cycles of disturbances and ecological imbalances, causing large-scale climatic catastrophes; ii) a homogenization of the structure and architecture of plant communities; iii) a marked loss in biological diversity and the banalization of flora; and iv) the spread of immigrant species through "artificialization" of environments that pose competition to indigenous plants in the undergrowth as well as in upper storeys. Abies alba, Buxus sempervirens, Carpinus betulus, Casatanea, Corylus, Fagus silvatica, F. orientalis, Frangula, Juglans, Ligustrum, Pinus silvestris, Pterocarya, Rhododendron ponticum s.l. Quercus ilex s.l., Q. pubescens s.l. A number of recent studies have sought to assess the dangers threatening Mediterranean flora as a whole (Gomez-Campo, 1985; Médail and Quézel, 1997), and the World Conservation Union (IUCN) has published a general survey of Mediterranean flora (excluding the Syrian Arab Republic, Lebanon and Turkey), indicating that 53 percent of endemic species, or 1 529 taxa, are currently threatened. Even so, data on endangered forest species in the Mediterranean region are still very fragmentary. A good number of North African trees (Olea marocana, Pyrus spp., Pinus nigra subsp. mauritanica, etc.) were not listed among the endangered woody species of the world in a recent IUCN study (Oldfield, Lusty and McKinven, 1998), or among the 1997 IUCN Red List of Threatened Plants (Walter and Gillett, 1998), which list only 45 of the 71 (at least) endangered tree species in the Mediterranean basin. The number of endemic species in this list (48) indicates how much is at stake in the conservation of these trees. Many of them are rare species that are progenitors of cultivated plants or that represent an interesting gene pool (Malus, Olea, Phoenix, Prunus and Pyrus). No full-scale survey of endangered forest communities in the Mediterranean basin has yet been made, despite some first steps in this direction (Quézel and Barbero, 1990; Quézel, 1991). Forests can be endangered for various reasons: i) special environmental requirements, particularly with regard to substratum, which means that they are naturally small systems (the case of some groupings that grow on gypsum or serpentine soils); ii) a marginal situation in terms of the geographic distribution of the species, which is often a result of bioclimatic compensation or historical phenomena (e.g. formations carved out during the pleistocene ice age that permit the development of isolated or unique plant communities) as in the case of the Dracaena draco population of southwestern Morocco (Médail and Quézel, 1999); and especially hi) the intense and generalized impact of animals and human beings on communities that were originally very widespread. To the north of the Mediterranean, the most serious threats are facing relict populations of Abies nebrodensis and Zelkova sicula (between 200 and 250 individuals) in Sicily, while Abies pinsapo and Quercus petraea subsp. huguetiana populations in Spain and Pinus nigra subsp. dalmatica populations in former Yugoslavia, although localized, seem somewhat less endangered. 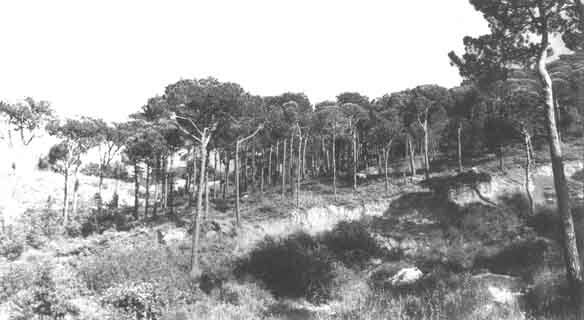 On the Mediterranean coast of France, pre-forest thermo-Mediterranean groupings (Ceratonia siliqua and Chamaerops humilis, and Olea and Euphorbia dendroides formations) and forest groupings (mature holm oak forests with Laurus nobilis or Cyclamen balearicum, and downy oak forests with Cyclamen repandum) are receding as a result of urbanization or fragmentation, which is responsible for the local extinction of some species or the isolation of populations. 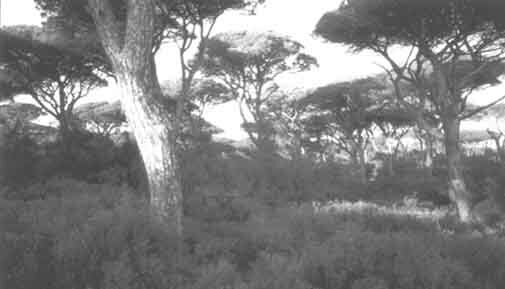 Most southern Mediterranean forests are endangered to some degree. In the Maghreb (Quézel and Barbero, 1990; Quézel, 1991), the situation is especially worrying for Abies marocana and A. numidica fir forests, and populations of Pinus nigra subsp. mauritanica, Cupressus atlantica, Betula pendula subsp. fontqueri, Olea marocana. Laurus azorica, Quercus afares and Q. faginea subsp. tlemcenensis, and even some Argania spinosa, Cedrus atlantica, Tetraclinis articulata and Juniperus thurifera forests. In the eastern Mediterranean, stricter forestry management (especially in Turkey) and the participation of local inhabitants in the benefits of exploitation have left forests in a better state of conservation (Quézel and Barbero, 1990), although certain communities deserve careful monitoring: Abies nordmanniana subsp. equitrojani, Quercus aucheri, Liquidambar orientalis and Fagus orientalis forests in Turkey, Cedrus brevifolia and Quercus alnifolia stands in Cyprus, scattered Zelkova abelicea and Phoenix theophrastii populations in Crete, and Abies borisii-regis, Aesculus hippocastanum and Pinus heldreichii populations. Conservation of forests and forest species in the Mediterranean basin is a complex issue, given the wide range of ecological situations, diverse forest uses and the pressure exercised by different cultural groups. Management of the various dynamic stages of forest systems demands consideration not only of forest communities and species per se, but also of associated ones on the edges of forests and in clearings. Although the fairly widespread distribution of most forest species would indicate that any threat to them is limited, the marginality of certain populations (based on their geographic isolation) and/or their ecological marginality (species linked to rare habitats) must be taken into account (Rameau and Olivier, 1991). Moreover, a fair number of trees represent key species whose preservation is vital for the sustainability of biogeochemical cycles. Repeated climatic disturbance sequences that have deeply affected the structure and ecological sequences of Mediterranean forests must be guaranteed, particularly in protected zones, in order to assure the sustainability of a mosaic of plant and animal communities and optimal biodiversity. Many woody species can subsist in isolated populations and in very restricted areas for several decades, or even for more than 100 years, as long as the main biotic conditions are sustained. However, geographically isolated and reduced populations are more vulnerable than any others and suffer more from the impact of random environmental events. Frankel, Brown and Burdon (1995) place the minimum number of trees necessary for long-term maintenance of a viable forest population at about 500. On the other hand, genetic variability seems less dependent on population size: an extremely small population such as that of Abies nebrodensis (29 adults and 20 saplings, according to the recent survey of Morandini, Ducci and Menguzzato, 1994) has a genetic variability similar to that found among dynamic populations of Abies alba in Calabria in a similar ecological situation (Vicario et al., 1995). The very precarious situation of the Abies nebrodensis relict population is a result of its low production of seed (as well as much-reduced seed viability) and of the nature of the habitat, with is unfavourable to the regeneration of the Nebrodi fir (Ducci, Proietti and Favre, 1998). The problem of in situ conservation of the genetic resources of Mediterranean forest species through existing natural reserves lies in the tact that such reserves are very seldom created with this aim in mind. The designation of conservation zones and their size is still governed more often by local considerations or by subjective, aesthetic criteria than by strict, multilevel analysis of the biodiversity of a given area. Although an archipelago of small reserves may contain more species, this approach is not ideal for the sustainable conservation of forest species populations. Certain taxa, such as core area species, will be conserved solely within areas large enough for their life cycle to unfold in the best possible way, without suffering the effects found in border areas. Only extensive reserves can guarantee the development of normal disturbance cycles and assure maintenance of the large vertebrate populations needed to guarantee the sustainability of a whole range of landscapes and the distribution of plant species. Therefore, it seems best to set up systems incorporating large unbroken reserves (of at least several hundred hectares) surrounded by buffer zones, making up a mosaic with differently managed areas (Frankel, Brown and Burdon, 1995). Such structures are foreseen in the "Biosphere Reserves" of UNESCO's Man and the Biosphere Programme. A global conservation strategy for threatened forest species or those considered of heritage interest therefore requires first and foremost a good knowledge of the ecology and the biology of species - a requirement that is seldom met. Maximum attention must be paid to endemic species because of their uniqueness and their limited range, and also to marginal populations. However, maintenance of the adaptive capacities of species through the pressure of selection by necessity requires in situ conservation encompassing dynamic management of the forest landscape. Akman, Y., Quézel, P., Ketenoglu, O. & Kurt, I. 1993. Analyse syntaxonomique des forêts de Liquidambar orientalis en Turquie. Ecologia mediterranea, 19: 49-57. Barbero, M., Loisel, R. & Quézel, P. 1995. Les essences arborées des îles méditerranéennes: leur rôle écologique et paysager. Ecologia mediterranea, 20(1/2): 53-69. Barbero, M., Bonin, G., Loisel, R. & Quézel, P. 1990. Changes and disturbances of forest ecosystems caused by human activities in the western part of the Mediterranean Basin. Vegetatio, 87: 151-173. Barbero, M., Loisel, R., Médail, F. & Quézel, P. 1999. Signification biogéographique et biodiversité des forêts du bassin méditerranéen. Bocconea, in press. Barbero, M., Loisel, R., Quézel, P., Richardson D.M. & Romane. F. 1998. Pines of the Mediterranean Basin. In D.M. Richardson, ed. Ecology and biogeography of Pinus, p. 153-170. Cambridge, UK, Cambridge University Press. Benabid, A. & Cuzin, F. 1997. Populations de dragonnier (Dracaena draco L. subsp. ajgal Benabid et Cuzin) au Maroc: valeurs taxinomique. biogéographique et phytosociologique. C. R. Acad. Sci. Paris, Sciences de la vie/Life Sciences, 320: 267-277. Bergmann, F. & Gregorius, H.R. 1992. Ecogeographical distribution and thermostability of isocitrate deshydrogenase (IDH) alloenzymes in European silver fir (Abies alba). Biochem. Syst. Ecol., 21: 597-605. Di Pascale, G., Garfi, G. & Quézel, P. 1992. Sur la présence d'un Zelkova nouveau en Sicile sud-orientale (Ulmaceae). Biocosme Mésogéen, 8(4)-9, (I): 401-409. Ducci, F., Proietti, R. & Favre, J.M. 1998. Le genre Abies en Italie: écologie générale, gestion sylvicole et ressources génétiques. Forêt médit., 19(2): 153-164. Frankel, O.H., Brown, A.H.D. & Burdon, J.J. 1995. The conservation of plant biodiversity. Cambridge, UK, Cambridge University Press. 299 pp. Gamisans, J. 1991. La végétation de la Corse. In D. Jeanmonod & H.M. Burdet, eds. Compléments au Prodrome de la Flore Corse, annexe 2. Geneva, Conserv. et Jard. bot. Geneve. 391 pp. Gomez-Campo, C., ed. 1985. Plant conservation in the Mediterranean area. Geobotany 7. Dordrecht, the Netherlands, W. Junk. 269 pp. Greuter, W., Burdet, H.M. & Long, G. 1984-1989. Med-Checklist. 3 vols. Geneva. Conserv. & Jard. bot. Genève. Hickman, J.C., ed. 1993. The Jepson manual. Higher plants of California. Berkeley and Los Angeles, USA, University of California Press. Médail, F. & Quézel, P. 1997. Hot-spots analysis for conservation of plant biodiversity in the Mediterranean basin. Ann. Missouri Bot. Gard., 84: 112-127. Médail, F. & Quézel, P. 1999. The phytogeographical significance of S.W. Morocco compared to the Canary Islands. Plant Ecol., in press. Michaud, H., Lumaret, R. & Romane, F. 1992. Variation in the genetic structure and reproductive biology of holm oak populations. Vegetatio, 99/100: 107-113. Mooney, H.A. & Dunn, E.L. 1970. Convergent evolution of Mediterranean-climate evergreen sclerophyll shrubs. Evolution, 24: 292-303. Morandini, R., Ducci, F. & Menguzzato, G. 1994. Abies nebrodensis (Lojac.) Mattei, inventario 1992. Ann. 1st. Sperm. Selvic. Arezzo, 22: 5-51. Olfield, S., Lusty, C. & McKinven, A. 1998. The world list of threatened trees. Cambridge, UK, IUCN Press. 650 pp. Pons, A. & Quézel, P. 1985. The history of the flora and vegetation and past and present human disturbance in the Mediterranean region. In C. Gomez-Campo, ed. Plant conservation in the Mediterranean area. Geobotany 7, p. 25-43. Dordrecht, the Netherlands, W. Junk. Quézel, P. 1976. Les forêts du pourtour méditerranéen. In Forêts et maquis méditerranéens: écologie, conservation et aménagements. Note technique MAB, 2:9-33. Paris, UNESCO. Quézel, P. 1985. Definition of the Mediterranean region and the origin of its flora. In C. Gomez-Campo, ed. Plant conservation in the Mediterranean area. Geobotany 7, p. 9-24. Dordrecht, the Netherlands, W. Junk. Quézel, P. 1991. Structures de végétation et flore en Afrique du Nord: leurs incidences sur les problèmes de conservation. In M. Rejdali & V.H. Heywood, eds. Conservation des ressources végétales. Rabat, Actes Editions, Institut agronomique et vétérinaire Hassan II. Quézel, P. 1995. La flore du bassin méditerranéen: origine, mise en place, endémisme. Ecologia mediterranea, 20(1/ 2): 19-39. Quézel, P. 1998. Diversité et répartition des sapins sur le pourtour méditerranéen. Forêt médit., 19(2): 93-104. Quézel, P. & Barbero, M. 1990. Les forêts méditerranéennes. Problèmes posés par leur signification historique, écologique et leur conservation. Acta Bot. Malacitana, 15: 145-178. Quézel, P. & Taylor, H.C. 1984. Les fruticées sempervirentes des régions méditerranéennes de l'Ancien Monde. Essai comparé d'interprétations des structures biologiques et des données historiques. Bot. Helv., 94: 133-144. Rameau, J.C. & Olivier, L. 1991. La biodiversité forestière et sa préservation. Intérêt patrimonial de la flore, de la végétation et des paysages forestiers. Rev. For. Fr., 43, num. sp. 1991: 19-27. Raven, P.H. & Axelrod, D.I. 1978. Origin and relationships of the California flora. Univ. California Public. Bot., 72: 1-134. Thirgood, J.V. 1981. Man and the Mediterranean forest. New York, Academic Press. 194 pp. Tutin, T.G. et al. 1968-1993. Flora Europaea. Vols 1-5. Cambridge, UK, Cambridge University Press. Verlaque, R., Médail, F., Quézel, P. & Babinot, J.F. 1997. Endémisme végétal et paléogéographie dans le bassin méditerranéen. Geobios, mém. sp. 21: 159-166. Vicario, F., Vendramin, G.G., Rossi, P., Lio, P. & Giannini, R. 1995. Allozyme, chloroplast DNA and RAPD markers for determining genetic relationships between Abies alba and the relict population of A. nebrodensis. Theor. Appl. Genet., 90: 1012-1018. Walter, K.S. & Gillett, H.J., eds. 1998. 7997 IUCN Red List of threatened plants. Compiled by the World Conservation Monitoring Centre. Gland, Switzerland and Cambridge, UK, IUCN-The World Conservation Union. Yaltirik F. & Boydak, M. 1991. Distribution and ecology of the palm Phoenix theophrasti (Palmae) in Turkey. Bot. Chron., 10: 869-872.